The banners measure 31.5” wide x 78.5” tall. Global Marketing & Communications invites members of the Webster University community to use one of its new vertical floor banners, at no charge. This is a great way to use our Webster logo branding as well as direct people to our website for more information. The blue and gold floor banners are easy to use and come in an easy-travel case weighing only seven pounds. When standing, the banners are 31.5” wide x 78.5” tall. It fits easily on stages as a classic backdrop and for photos. 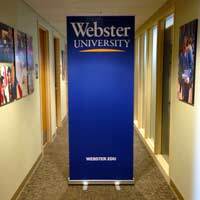 The height of the banners allows the Webster brand to be highly visible at a trade show or college event held in a crowded room. They will not scratch or fray and are resistant to ultra violet light fading. The banner retracts easily into its case when not in use. To reserve one for your event, contact Jennifer Gammage at jgammage@webster.edu. Please place your request at least two days prior to your event. To order your own floor banner, contact Jim Curran, Advertising Premium Sales, Inc. representative, at 314-872-7000 or jim@apspromos.com.